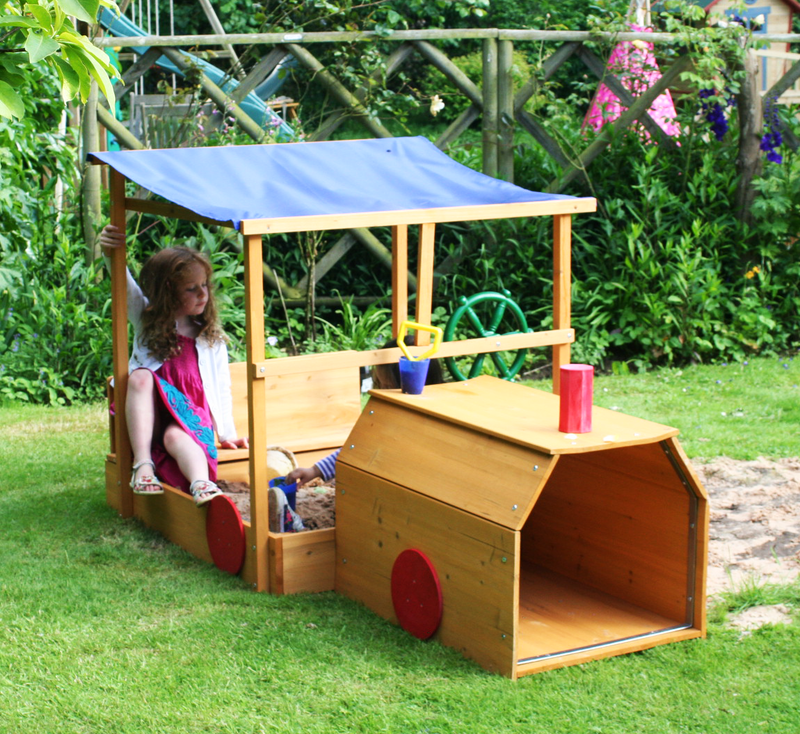 This amazing wooden sandpit is steaming its way right into our most popular sandpits and a lot of children's hearts, featuring a tunnel that doubles as a den or as a crawl tube through to the large sandpit. With little red wheels and a blue roof kids are often drawn to its colours and design while adults can't help but noticing how cute it is. The bench at the rear of the train is also a storage area for toys and the cover when not in use, the cover is handy for keeping unwanted debris and animals away from the sand when not in use. There is plenty of imagination play in this sandpit, be a train driver for a day or the train hand that shovels coal into the fire. Build imaginative sandcastles and creative structures in the sand and start all over again the next day in your own sand world. We don't sell it but play sand is available at most garden centres and DIY stores. We always recommend buying a bit extra for topping up and refreshing later on. 2 or 3 x 25kg bags should be about right. Sandpits offer hours of creative and wholesome fun and with the addition of the train structure too you can almost see their imaginations run wild.